Let us help you size a Standard Xchange heat exchanger in Wisconsin, the Upper Peninsula of Michigan and Illinois today! For over 90 years, Standard Xchange has been designing and manufacturing hear transfer solutions in just about every industry. 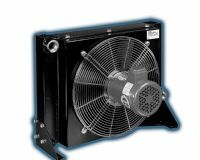 Standard Xchange currently offers the widest range of heat exchanging products available anywhere. With all the most experience, best research, and cutting edge design capability in heat transfer, Standard Xchange has a solid solution for your application. From the basic shell and tube heat exchangers to more complex and sophisticated, precision engineered units, any application requirements can be met. Whether you need air coolers, heat transfer coils, compact brazed, welded, gasketed plate unites, or packaged steam condensers, Standard Xchange has the product and solution to meet your heat transfer requirements. Every Standard Xchange heat exchanger is supported by first-rate technical expertise ensuring that every product run at optimal efficiency and perform at the highest level. 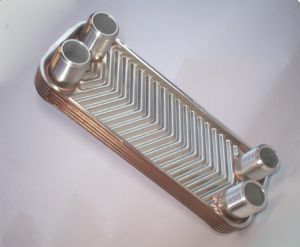 Additionally, when you buy a Standard Xchange heat exchanger you have the assurance of technical guidance throughout the process of evaluating, selecting and installing the appropriate heat exchanger. Anderson Process and Standard Xchange experts can help define your needs, determine specifications, and answer all your questions, while providing you with a complete integrated system solution for your application. Standard Xchange BCF, SSCF, SX2000 and B300 series are pre-engineered shell and tube heat exchangers. The BCF, SSCF and SX 2000 are straight tube, fixed tubesheet heat exchangers. The tube side can be steam or mechanically steamed but the shell side may not be mechanically cleaned. They provide maximum heat transfer surface area per shell and tube size, however there is tolerance of differential expansion. 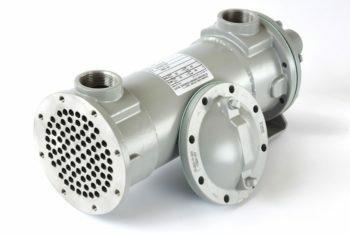 The B300 Series is a U-tube, removable bundle heat exchanger and allow for thermal expansion/shock, but individual tube replacement is not always possible. The tubes can only be cleaned chemically and single pass is not possible on the tube side making counter current flow impossible. Standard Xchange Plateflow series are plate and frame compact heat exchangers. They feature a higher surface area to volume ratio comparted to shell and tube heat exchangers and their design promotes turbulent flow to provide higher heat transfer coefficients. The true concurrent flow maximizes the mean temperature difference between fluids. Plateflow models include a one piece molded gasket that can either have a glued or glueless design. Semi-welded plates are ideal for harsh fluids or refriderants by reducing the welded side’s exposed gasket surface by almost 90%. Double wall protection and free flow clog resistant options are available. 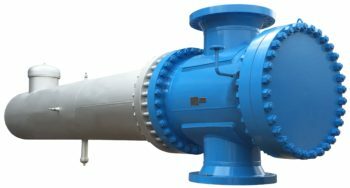 The Standard Xchange Century Series are custom engineered shell and tube heat exchangers that come in a variety of configurations. Both straight tube and U-tube options are available with removable bundles, channel, bonnet, or integral channels. Single and Multi-pass tube arrangements and vertical or horizontal mounting are possible. Varieties of tube designs exist to expedite cleaning, handle volatile/toxic fluids, and withstand thermal expansion/shock to meet your application needs. Standard Xchange BrazePak brazed plate heat exchangers are solid, compact high performing heat exchangers that are 1/6th the size, 1/5th the weight, use only 1/8th the liquid and requires only 1/3rd -1/5th the surface area as standard shell and tube units. 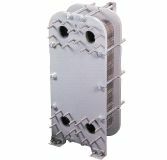 The double wall brazed plate design allows for more turbulant flow than other plate heat exchangers. Unique leak prevention and containment is possible along with quick and easy leak detection. Brazepak units are ideal as refrigerant condensers and evaporators, as oil coolers for engines and machinery and in many other industrial applications. Single and double wall options are available. Standard Xchange air cooled heat exchangers work best when there is no water or other cooling fluid available. AirEx and FanEx models are compact, well-constructed, and dependable. They work best in applications to cool oil or other fluids with air when size, efficiency, and quiet operation are desirable.